MVS Madison gets new headquarters! The awesomeness of the VS house. Well, dear future VSer, #2 may be a disqualifier (although we are within a quarter mile of one lake and 3/4 of a mile from the other), and #3 may be practically nonexistent, but I can say with some certainty that we are in the lead on #7. Also you don’t know it yet but #6 is gonna be huge. With regard to #7, the awesomeness of the Madison MVS house, we are now at 315 North Ingersoll, Madison, Wisconsin, 53703. We are half a mile from a beautiful park, a swimming beach, and an ice skating rink. We’re on several major bus routes. We’re around the corner from some of the hippest members of our church. We’re within walking distance of coffee shops, bike shops, and basically all of the establishments we frequented in our old house, which is only 3/4 mile away from our new house. But you won’t need any of that when you see the house itself. Three floors, five bedrooms (three on the second floor, two on the third), a front and a back porch, a screened-in all-season porch on the second floor (with a view to the maple-tree-shaded backyard), gorgeous artwork, colorful walls and trim, an enormous dining room table, and a compost pile and a weber grill in the backyard. Not to mention the functioning wood stove with a steam-breathing dragon-shaped cast-iron humidifier on top of it. Plenty of space for hosting guests, hardwood floors, everything in good condition. Wow, look who’s turning into a realtor. The only, and I mean only, drawback is that there’s only one bathroom. I hope to post some photos of the new place soon (when we’ve unpacked all our boxes, set up our wireless, and arranged the furniture in accordance with Carola Breckbill’s feng shui.) Stay tuned. MVSer Ben Martin’s farewell party took place today at the Breckbills’ home in Stoughton. Roasts and Toasts ensued. Together with some other attendees, the MVSers wrote a little ode to Ben, who leaves us on Wednesday. Who went fishing all day to catch salmon. And he ended the MVS famine. It destroyed their chance for victory. It’s not going to get us all down. And be glad to be rid of this clown! So don’t let him escape you un-kissed! Please comment with your own Ben Martin roasts and toasts! A while ago, actually. It will be ours on August 15th! Well, not really ours, as we’ll still be renting, but we will move in on August 15th. It’s beautiful. The walls are painted colors. It has three floors and an unfinished basement. It has five bedrooms. It has one bathroom. But it has a light-filled living room with a wood-burning stove, a spacious and airy kitchen with a butcher-block table, and a screened-in porch with hammock hooks. Ryan will be living there all year. I will be there until October. Ben will be leaving us on August 4th, and Andrew and Annie will be moving into their own place just down the street on moving day. You can find the new MVS house on Ingersoll Street, between Johnson and Gorham, and conveniently located on many bus routes. Plenty of news in the intervening days. We’re all coming off a lovely Fourth of July holiday, and while the Fourth is not a particularly popular holiday among Mennonites, our conversations seem to indicate that all of us took full advantage of the long weekend. Annie and Andrew’s camping trip had its setbacks (sunburn and saddle sores) and its perks (handful upon handful of fresh, wild black raspberries at their campsite). Ben’s sister visited, along with her fiancé, and together they visited the farmers’ market and Woodman’s in the same weekend. I took public transit all the way to Madison from my Indianapolis home (a first for me; I’d be willing to bet I’ve taken the bus more this year than in all the previous years of my life combined.) I had the unexpected pleasure of meeting someone I’d known in high school but hadn’t seen since 2005 and talking with him all the way to Chicago. You just don’t get that kind of interaction in a car. Tonight the house went out for dinner. Andrew’s parents funded the supper outing as a thank-you for our hosting them back in June. Annie tasked us all with making a list of five restaurants we’d like to try. Ben’s consisted entirely of “Pollo Inka.” After discussing it civilly, two places had been mentioned by four of the five of us: the Old Fashioned and Brocach. I guess we’re partial to restaurants downtown on the square. Brocach was the choice, and boy am I glad we went. It was like a mini trip to Ireland. Shepherd’s pie, corned beef, fish and chips, and bangers and mash were the chosen fare. Hearty food and hearty conversation. On a personal note, I’m happy to report that my bike ride to the Brocach was successful, and that’s saying something. First of all, I have a broken foot (a healing broken foot, but a broken foot nonetheless), and second, I had a bike accident two weeks ago, and this was my first time back on my bike since then. I have to hand it to my housemates, friends, and neighbors. Two weeks’ perspective on the accident still leaves me in awe. They picked me up and put me back together after I ran my bike into a car mirror. It was searing confusion in a headlong spray of shattering glass. But it was also everyday grace, with all the attendant stinging peroxide and calm-under-pressure medical advice. The couple across the street jumped off their porch and helped me onto their stairs. She made sure I was coherent and brought washcloths for my cuts and scrapes. He offered me a beer (which I refused), water (which I accepted) and his kind sympathy (which I was in no position to turn down). A man passing by on the sidewalk brought a tool out of his back pocket, straightened my handlebars, and walked off without saying a word. The car owner refused to let me pay for the damage. I caught my breath and called my support network, and help came: first Sarah, who went and got a car to drive me to urgent care, and then Annie and Andrew, who arrived soon after. All three of them sat in the waiting room for hours. Annie helped me fill out paperwork and then held my hand while a doctor pulled glass out of my finger. Andrew and Sarah sat, stalwart amid the celeb magazines, and waited for news. I would have been lost without them. Might be time to tell you what’s happening with all of us when the year is out. Ryan is the lone term renewal. He’ll be staying on at Centro Hispano, continuing to build his accounting experience and resume. Andrew and Annie plan to stay in Madison and are currently apartment searching. Andrew is awaiting a hiring decision from his current placement organization, Community Action Coalition. He hopes to continue on in his current role working with food pickup and delivery. Annie is in the throes of a job search, seeking work in a nonprofit that promotes social justice and sustainability. Ben is returning to his home state of Indiana with as-yet unformulated plans. We’re looking forward to two new MVSers, Andy and Joe, who will be joining us in August. A third is unconfirmed at press time. Comment with corrections, amendments, complaints, or smart remarks. You might say that chemistry inspired the Giving Tree. A retired high school teacher, first of biology and then chemistry, quilter Louise Schotz was inspired to start quilting about eight years before her retirement, thanks to an art-science hybrid course she taught. She now teaches quilting and sewing classes out of her home studio in Irma, WI. Louise’s chemistry class encouraged students to explore the science behind art. They studied materials like paper, glass, and plastic. “Then we would do art projects,” she explained. Her students even worked with metals, doing welding. Upon retirement, Louise signed up for art classes. She began collecting fabric and going to national quilt shows. “I discovered that quilting isn’t necessarily making a quilt to put on your bed,” she remarked. The quilt that now hangs in the front lobby of the Ice Age Trail Alliance building is proof of that. 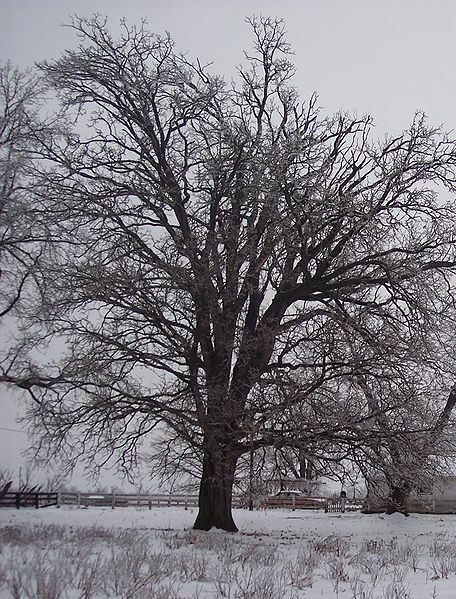 This Giving Tree has a mission for the Ice Age Trail. It was designed to accommodate little additions: a leaf here, a few acorns there. 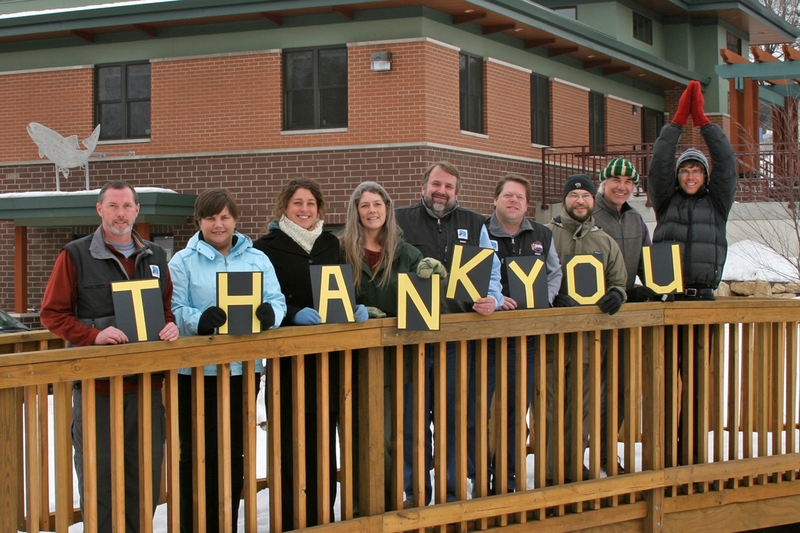 Supporters of the Ice Age Trail can become a part of the Giving Tree by making a donation. Louise will embroider each name on the leaf, acorn, footprint, root, or knothole each sponsor has purchased. It will then be sewn onto the quilt – a piece of art that is alive and growing. While it’s an unconventional method for traditional quilting – in a quilt show, such work would be criticized for looseness – Louise feels it fits the spirit of the Trail. “Because I lived with Herb for 40 years, the quilt had to be like this,” she said. The Schotzes have had moments of artistic collaboration. For instance, when their neighbor, Becky, insisted, “It’s gotta have a pond,” Louise and Herb had a great debate. There was no getting around the need for some water in the quilt, given the amount of water on and around the Ice Age Trail. But a pond of what color? Herb thought the water should be light blue. Louise wasn’t so sure it shouldn’t be dark blue. A debate ensued. Eventually Herb just hopped in his truck and drove off. He hadn’t blown a fuse – he’d gone to look at a pond. When he returned, he personally picked out the fabric – dark blue – for the water. Last weekend, I got to participate in an oak savanna restoration with Gary Werner and some Ice Age Trail volunteers. The goal was sort of to “weed out” undesirable trees and shrubs like box elder and hateful, invasive buckthorn so that any future controlled burns of the area wouldn’t be able to spread out of control. Several sawyers – guys with chainsaws and specific gear and training – took down a couple dozen trees. Every few minutes, we’d all stop what we were doing to watch as another tree fell. Then we sliced and diced each tree into pieces big enough to carry. We dragged them to one of two gigantic brush piles that took turns smoldering and blazing over our heads. The location was the Table Bluff segment of the Ice Age Trail. The trail goes through an oak savanna/prairie that was planted around fifteen years ago on the front end of the property. It looks great. 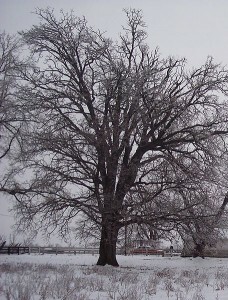 The old oaks are thriving, and the young ones, mostly Bur Oaks, stand over six feet tall. That’s a grand accomplishment with all the deer in the area that love the tender shoots of baby oak trees. Indeed, many early Wisconsin settlers broke their plowshare trying to cut the bond between these brushy oaks and the prairie sod. Much to the pioneers’ chagrin, they discovered that three-foot-tall oak brush grew atop 100- to 200-year-old stumps hidden deep underground. Why not leave the woods around the trail as they are? you may ask. Good question. The function of prairie and oak savanna restorations, as far as I understand it, is twofold. First, as native plant communities, they represent a biodiversity that vanishes in development and sprawl. Prairies in Wisconsin harbor the federally endangered Karner Blue Butterfly as other landscapes cannot do. I did a report on these little guys in about second grade, I think. Their larvae eat only lupine, a plant native to the Wisconsin prairies. As the prairies have dwindled, so has the butterfly. Of its old stomping (fluttering?) grounds from New Hampshire to Minnesota, only a few havens remain in Michigan, New York, and our very own Wisconsin. My home state, Indiana, no longer sees much of it, sadly. So there’s an example of the need for such biodiversity in habitat. Links the history and diverse human cultures of the land that we call Wisconsin. Restoring land in the trail corridor and in its viewshed to its pre-settlement state makes hiking the Trail an educational experience. Hikers get to see what Wisconsin looked like before the farms, before the highways, before the houses. That knowledge, I think, makes people feel closer to the land they live on, and maybe it makes us more aware of our impacts on it. But not only that – seeing native landscapes allows us to imagine the ways that glaciation affected the lay of the land. 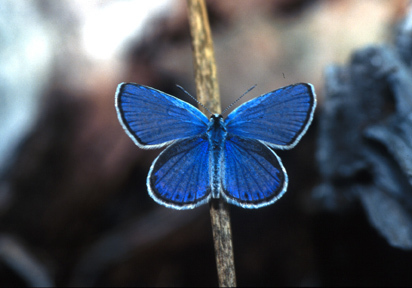 When prairie grasses and Bur oaks sway gently on the back of an esker, we can see how well that ridge of sand and gravel, created as silty streams flowed out of the melting glacier, plays host to exactly the kind of habitat where Karner Blue Butterflies flourish. If you want to participate in the work the Ice Age Trail is doing, become a member. Habitat restoration on the Ice Age Trail is only one of the many ways that one can steward the land. For your personal entertainment and edification, here are two fantastic songs by a fantastic band called Jayber Crow. One’s about another heat-resistant tree species, the Jack Pine, which actually needs fire in order for its seeds to germinate. The other is a love song for a prairie fire. 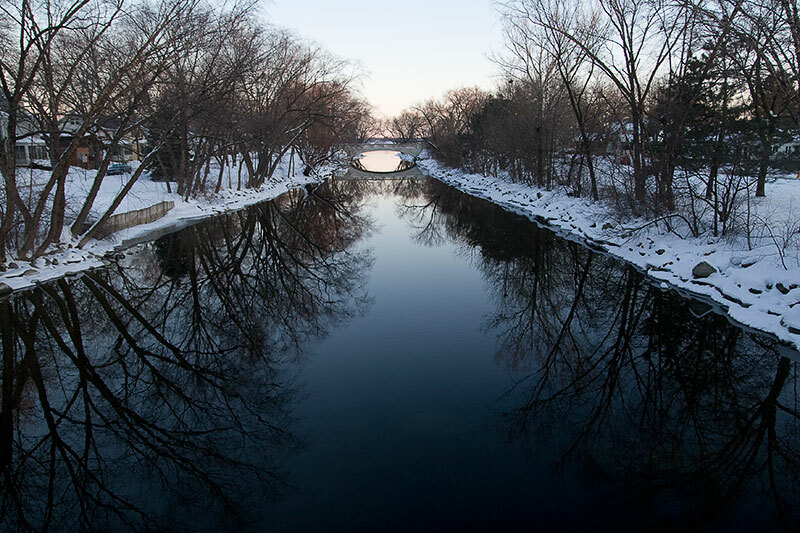 The Yahara River runs from Lake Mendota to Monona about half a mile away from our house. This was the view on my bike commute home this evening. The staff of the Ice Age Trail Alliance, in front of our building in Cross Plains, posing for a thank-you photo for our board members. Left to right: Brad (eastern field representative), Rebecca (development director), me, Jo (administrative assistant), Mike (executive director), Randy (western field representative), Kevin (lands and stewardship manager), Tim (director of field operations), and Eric (communications specialist and exclamation point). Ok, readers, say a little prayer for us (and our support committee as they discern where to go from here). The aforementioned possible house for next year has been purchased by another buyer. There’s no doubt that we will have a house next year (that’s a good thing, since I’ll be VSing until at least October), and there’s no doubt in my mind that it will be a good one. But oh the suspense!